In designing and implementing rural development projects, our prime goal and objective is to improve the livelihoods of the people who we work with and serve. We report on project outcomes and achievements, we measure project success against the logical framework and we prepare completion reports showing the impact with hard facts and figures. But there is nothing better, more powerful and moving than seeing with your own two eyes the impact of a rural development project on the lives of people. Do you know of any international financial institutions or UN agencies that have someone named after them? I bet you there are not many. 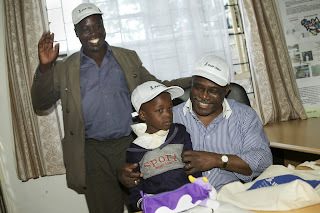 Well, IFAD does and we were lucky enough to meet Stephen Ifad Arisa Monari - the boy called IFAD! 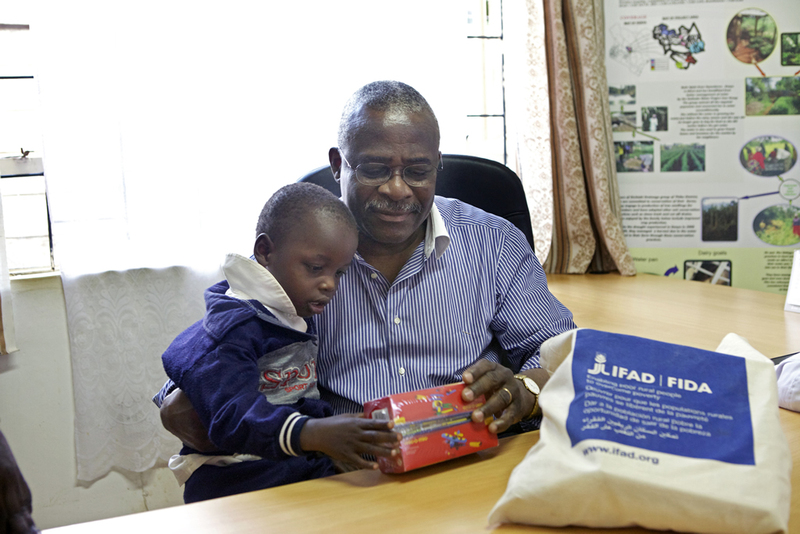 Recently while conducting an evaluation activity in Kenya, IFAD’s office of evaluation came across Stephen Ifad. And Stephen Ifad’s story is quite extraordinary. In 2005, when IFAD-funded Southern Nyanza Community Development Project started its operations to increase on-farm labour productivity and improve food security and nutrition in Nyamira a district of Southern Nyanza, Stephen Ifad’s father, Meshack Monari, dismissed the project initiatives. A skeptical Monari initially failed to understand the potential of the project and went out of his way to derail the project activities by discouraging his fellow villagers to get involved in the project activities. A highly determined implementing officer, Benjamin Angir, persuaded Monari to give the project a chance and sent him on a learning tour to Nakuru district in the neighbouring Rift Valley. There, Monari met other farmers and saw in person, how thanks to rural development and agriculture interventions the farmers had managed to improve their livelihoods, increase their income and were leading a better life. Back home, Monari had second thoughts. He started to get involved in the project and encouraged his fellow villagers to join the project. Thanks to the community-driven component of the IFAD-funded project, Monari and the other farmers articulated their needs and priorities and took ownership of the project. Already a tea and maize grower, thanks to the IFAD-funded project Monari started expanding his crops base to banana, sweet potato, pineapple and embraced goat rearing and beekeeping. Twelve months into the project, Monari was reaping the benefits of the IFAD-funded Southern Nyanza Community Development Project. So, when on 25 July 2006, his wife Caren gave birth to a baby boy, Monari named the child Stephen Ifad Arisa Monari. Taking advantage of the IFAD President’s visit to Kenya, Monari and young Stephen Ifad made a trip to Nyeri, to meet with IFAD President who was visiting the IFAD-funded Central Kenya Dry Area Smallholder and Community Services Development Project. A beaming Dorothy Owino, the project manager of Southern Nyanza Community Development Project and a proud Monari father, accompanied young Stephen Ifad and introduced him to IFAD President, Dr Kanayo Nwanze. “Today I use the income from my banana farm to buy maize to feed the family. The money from sweet potato sales goes to pay the school fees for the children,” explained Monari. “I have a bank account. I have electricity at home and recently have bought a TV so now I know what is happening in the rest of world. I now have a comfortable life and I am never idle and have finally understood that time is money!” concluded Monari. 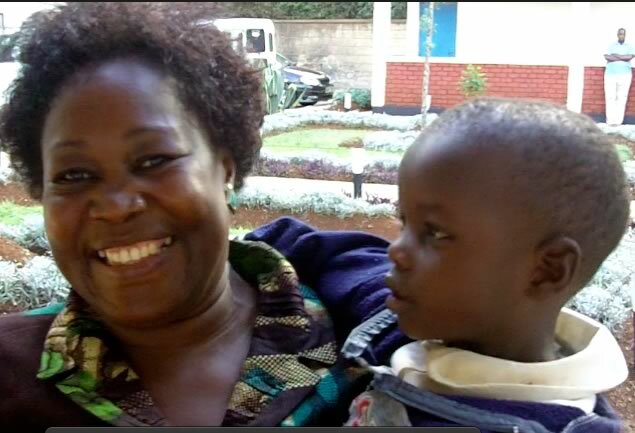 Once a skeptic, today Monari has a monthly income of KES 10,000 and aspires to earn KES 40,000 a month by next year. He has earned himself a new social status in his village and is a mentor for more than 50 farmers. “The least I could do was pay tribute to the organization that had transformed my life for the better by naming by boy Ifad”, explained Monari shaking hands with IFAD President. Stephen Ifad is a living testimony of the power and potential of agriculture. He is a living testimony of how thanks to community-driven development projects, smallholder farmers and producers can take their lives in their hands and build a better future for themselves. Stephen Ifad is a living testimony of how successful rural development and agricultural interventions can help poor rural people to come out of poverty and acquire social status. 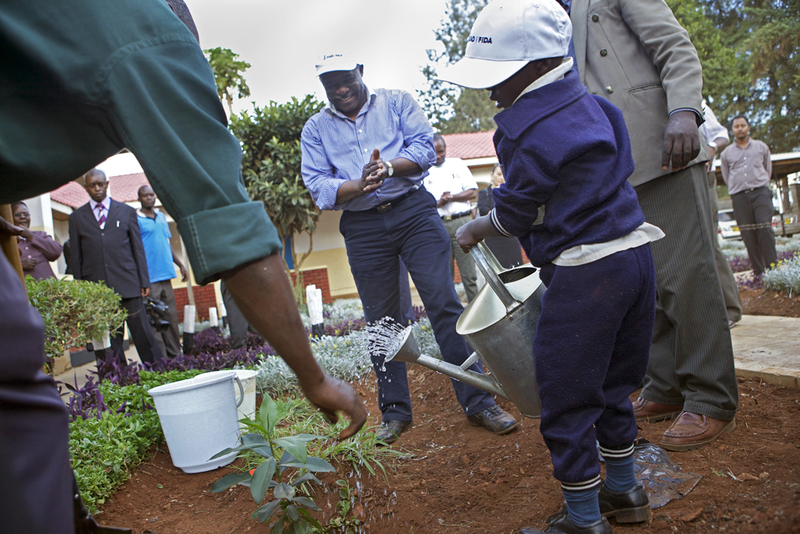 In Nwanze’s arms young Stephen Ifad examined his gifts, wearing his IFAD cap, together with the President they planted a commemorative tree. The entire IFAD family wishes Stephen Ifad and his family all the best. We are sure that Monari and his family will move from success to success. And we are proud that it was an IFAD-funded project that changed the lives of this young family for the better! Jambo, the routero bus is coming!